The Abs Diet Workout 2 is the perfect home fitness program for beginners as well as those experienced with the Abs Diet system. The program provides motivation and demonstrates an excercise regime that anyone can fit into their day, and is designed so that viewers can watch it over and over. The Ads Diet Workout 2 is also incredibly flexible, providing workout programs for 3, 4, 5 or 6 day a week structures, along with excercise options of varying intensity as your fitness level increases. -Bonus: the abs diet eating plan. In the introduction, the trainer, Terry Simpson, explains that the workout is based on the ABS 3 system and describes its principles. This is detailed in the book called The Abs Diet Get Fit Stay Fit Plan: The Exercise Program to Flatten Your Belly, Reshape Your Body, and Give You Abs for Life!. The diet aspect of the Abs Diet is described in the section called `Bonus: The Abs Diet Eating Plan section'. Under Weekly Schedules, there are 4 options. I decided to try the '3 times a week' option. I decided to try the beginner abdominal and weight workout. The trainer, Terry, was accompanied by 2 ladies Jenny and Shaela. They were super-fit. The first part was the warm up which consisted of various stretches and a short jog. Next up was the abdominal workout. For this you needed a mat and light dumbbells. For each exercise there was a beginner option (done by Jenny) and an intermediate option (done by Terry and Shaela). All the exercises came from the books: The Abs Diet: The Six-Week Plan to Flatten Your Stomach and Keep You Lean for Life and The Abs Diet Get Fit Stay Fit Plan: The Exercise Program to Flatten Your Belly, Reshape Your Body, and Give You Abs for Life!. After the abdominal section was the big muscle circuit. Equipment needed was hand weights, mat and Swiss ball. The big muscle circuit was tough because of the number of reps of each exercise. The exercises were done for either 60 or 90 seconds. They were done in a slow and controlled manner. The descriptions and demonstrations by the instructor were very helpful. During this section of the DVD I was sweating profusely and my muscles ached. The effectiveness is definitely in the number of reps. The only thing missing from this workout is a cool down. I had to stretch on my own at the end. The big muscle circuit and speed interval training consisted of a warm up, weight exercises and cardio. Materials needed for the muscle circuit - hand weights, Swiss ball and mat. For the cardio, jogging, jumping jacks, skipping, knee skips, squat hops and thrust reach-ups (the hardest) are done. Periods of low and high intensity are alternated. By the middle of the workout you will be panting and sweating. This is a user-friendly DVD, highly recommended for those of us trying to shed some pounds/ tone up. 6. I would recommend that 6-times weekly option, but other options are also okay. Good workout, with an instructor who cues well. Countdowns for the timed segments. Some beginner modifications. When you have a separate intro section, and this DVD does, introduce your fellow exercisers there, not in the workout segments. You get tired of hearing the intros each and every time. Same with the workout breakdown/technique explanations/equipment required, do it elsewhere, so that you're not just standing there wasting time. Warning to those who don't like high-impact cardio, this DVD has some, and little in the way of modifications. Wouldn't be quite so bad if it were done on grass or a mat or carpet. I wish people would remember that "aerobic" doesn't necessarily have to be rough on the joints. I was expecting something along the lines of the book "The Abs Diet Get Fit, Stay Fit Plan," which offered a lot of variety. This is partly why I'm so disappointed. This appears to be "Abs Diet" in name only. First off, all fitness DVDs should state up front what equipment you will need. This one does not. You'll need a mat, a pair of dumbbells, and for intermediate/advanced exercisers, a fitness ball to use as a weight bench. Unlike the previous DVD, there are is no diet information - just workouts divided by frequency (3 to 6 times a week), and then by level. Regardless of which level you choose, you'll get the same thing: a 3-minute warm-up (static stretches and very light cardio), an abs segment, an intermediate/advanced weights circuit routine, and a cardio workout. The only difference in the entire thing is in the abs workout segment: beginners do 10 minutes, advanced do 12. The exercises in the 25-minute circuit routine are straightforward, fairly standard (chest presses, shoulder presses, kickbacks, lunges, squats, crunches, etc. ), and the same for ALL levels. Beginners will have to watch for modifications, even if they chose the "Beginner" menu item. Overall it flows well, and though the music is still a little annoying, it is not as bad as the first DVD. For cardio, there's a 25-minute "speed interval" workout - a high/low intensity mix of jogging, straddle hops, squat jumps, jumping jacks, knee lifts, etc. There are no modifications, so this part of the DVD may be difficult for new exercisers, people very out of shape, or those with knee/back problems. For mix and match, you can combine the 3-minute warm-up with either 10- or 12-minute abs, plus 25 minutes of circuit training (w/modifications) and 25 minutes of hi/lo cardio intervals. My 3 stars are maily due to the lack of labeling about equipment, an intermediate/advanced workout labeled as beginner (if it's "Beginner," the workout should be tailored as such), a cardio workout that's the same for all fitness levels, and a suprising lack of variety. 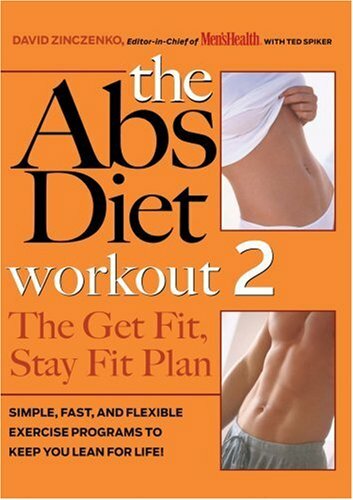 I'd recommend "The Abs Diet Get Fit, Stay Fit Plan" book over this DVD. The CafeWriter obviously wasn't watching the DVD very carefully. There IS diet information on this DVD. Plus, the swiss ball is only needed if you want to do the Intermediate level. There is a woman in the back who shows you how to do exercises without the swiss ball (beginner's level). Not all of the exercises require that you use a swiss ball. Plus, it's great to see both levels at once, so you can alternate between the two depending on the difficulty level at which you want to perform an exercise. You can also select your plan for 3, 4, 5, or 6 days a week (through the Weekly Schedules menu). This DVD offers a lot more options and customization than the Vol 1 DVD. * In most DVDs, either the camera work, or the instructor leave you guessing as to what you are supposed to be doing. The instructor is excellent about explaining and cuing you to the next move. * The instructors don't necessarily explain what benefit you get out of the exercises, but this instructor does. Additionally, he will remind you of points to be concerned in the middle of an exercise so you can improve your workout and form. * Most DVDs are too slow or too fast. This one lets you hurt yourself at your own pace -- if you are not ready, you stick to basic. If you need more of a workout, you do the intermediate which is shown in parallel with the basic. Only HIIT dvd I've found! I really like this dvd. Although I gave the first one a good review, I quickly outgrew it and stopped using it. This dvd, though, is a different story. I've been trying to incorporate HIIT cardio into my workouts and have had a difficult time doing it since it's so difficult to do. The HIIT cardio on this dvd is perfect to go along with. It's 25 minutes of pure high intensity interval training. And, it's HARD, but it's kind of fun, too. Another good thing that stands out on this is the advanced abdominal portion. It starts out easy, but the truth is, by the last set, I was a bit nauseous since it was that difficult. That has NEVER happened to me-- EVER. I can do abs for a LONG LONG time and still have more energy. This, for some reason, was a bit harder than I expected. I'm impressed. I am reviewing these sections only since I do other weight training workouts and didn't purchase this dvd for those portions. I did do the beginner abs, though, and that was not difficult at all. The guy leading the workouts is friendly and cues well.